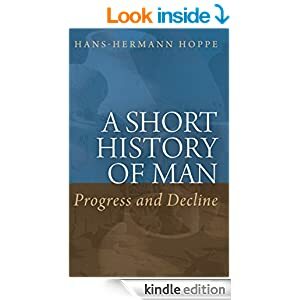 A Short History of Man: Progress and Decline represents nothing less than a sweeping revisionist history of mankind, in a concise and readable volume. Dr. Hoppe skillfully weaves history, sociology, ethics, and Misesian praxeology to present an alternative and highly challenging view of human economic development over the ages. As always, Dr. Hoppe addresses the fundamental questions as only he can. How do family and social bonds develop? Why is the concept of private property so vitally important to human flourishing? What made the leap from a Malthusian subsistence society to an industrial society possible? How did we devolve from aristocracy to monarchy to social democratic welfare states? And how did modern central governments become the all-powerful rulers over nearly every aspect of our lives? Dr. Hoppe examines and answers all of these often thorny questions without resorting to platitudes or bowdlerized history. This is Hoppe at his best: calmly and methodically skewing sacred cows.